Warwick High School is proud to recognize senior Shannon Hegarty as this weeks’ Bill Garcia Agency Allstate Student-Athlete of the Week. The senior Track and Field standout is a four-varsity competitor and two-time Orange County Meet Qualifier (200 meters). Shannon and her 4 X 100 meter relay team competed for the Purple and Gold at the Prestigious Penn Relays this past spring. 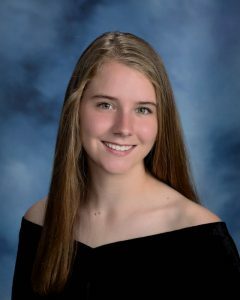 Shannon has a weighted grade point average of 95.6 and is one of Warwick Valley’s top female student athletes. Her classes include Advanced Placement courses for college credit in government, literature and OCCC calculus. She is four-year recipient of the NYSPHSAA Scholar-Athlete Award for maintaining a 90 or better average in season. Shannon will attend Oneonta State in the fall and plans to study English. She is the daughter of John (’85) and Jean Hegarty (’85) of Warwick. Her brother Kevin is a former Warwick Valley High School PE Student of the Year and recent Cortland State graduate.